A scale model of our inner solar system has been built in the park. 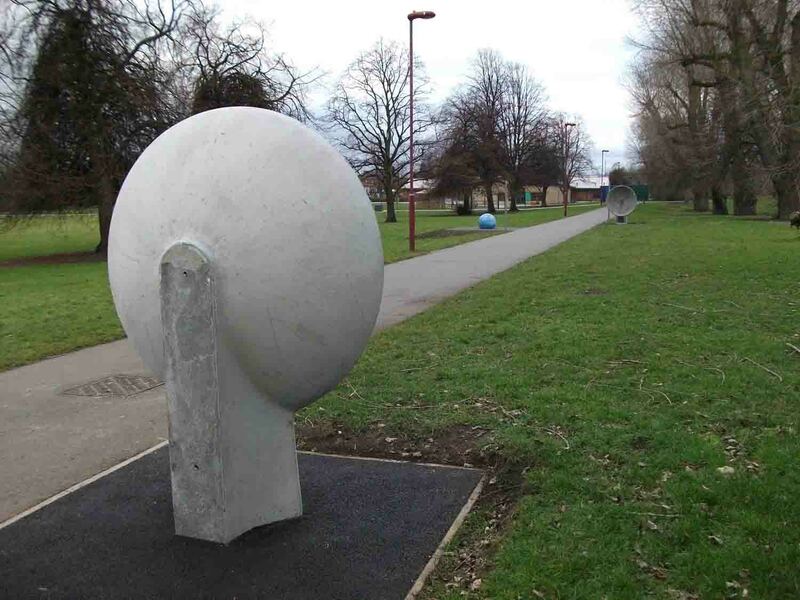 Each of the four planets has been carefully positioned in an 'orbit' around a central 'Sun' located near the play area. The distance from the sun has been scaled so that 1 metre in the park represents 1,000,000 km in the solar system. The Sun is our closest star, the one that our planet orbits. Almost everything we do relies on energy from the Sun. The plants that we eat use the its energy to grow. The coal and oil that we use in power stations and cars comes from plants and animals that trapped the Sun's energy millions of years ago. Without heat from the Sun, no water could flow on Earth's surface, it would be ice. That would mean no hydro-electric or tidal power. Even winds are driven by the Sun heating the air, land and sea. In Alvaston Park, the Sun is represented by a mosaic created by pupils from Lakeside School. Next to the Sun is a small mosaic of Earth that is to the same scale, 109 Earths would fit end to end across the width of the Sun. If the Sun were hollow, it would take more than a million Earths to fill it. If you are interested in sizes and scales, why not visit our "How Big?" exhibit? The images on the Sun mosaic have two themes. 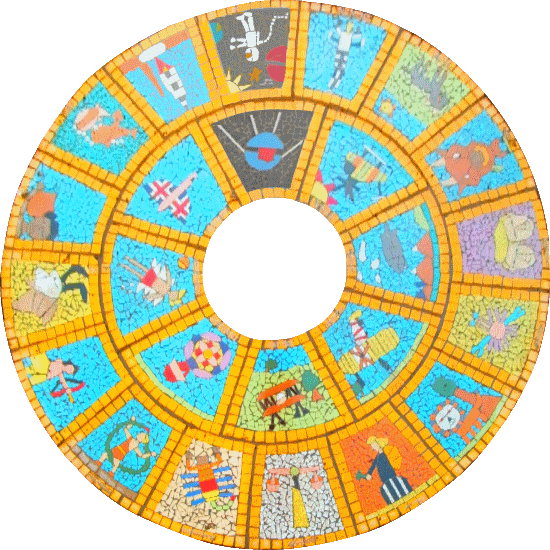 Thirteen of the outer sections show the zodiac constellations. These are the star pictures that the Sun, Moon and planets appear to travel through as Earth makes its annual journey around the Sun. If you imagine walking around Earth's equator drawing a line in the sky directly above your head (perhaps with a giant pencil), you will have drawn the ecliptic. The zodiac constellations all cross this imaginary line. They mostly show people and creatures from Greek mythology. The remaining sections show our adventures into the sky and beyond. This is a history of flight and tracks not only the technology humans have developed to take us tiny steps towards the stars, but also some of the stories, old and new, that we have dreamed up. Just as astronomy is intertwined with stories and attempts to predict the future, so too is technology. Without ideas and dreams there can be no progress. Click on a panel of the mosaic for more information. On 20th July 1969, Apollo 11 was the first space-flight to land humans on the moon. Neil Armstrong was the first man to set foot on the moon, where he spoke the famous words "That's one small step for [a] man, one giant leap for mankind." Notice his red eye. This represents the red giant star Aldebaran. Taurus is a very easy to find winter constellation. Look for a V-shape of stars Aldebaran is the brightest of them, and if your eyes have been given time to adjust to the darkness, the red colour may be visible. In the sky, the heads of the twins are represented by the bright stars Castor and Pollux. This is a faint constellation and can be quite difficult to see. A bright summer constellation - look for a backwards question mark in the sky. The brightest star is Regulus (latin for "little king"). The brightest star in Virgo is Spica. Spica is a binary system: there are actually two stars orbiting each other. They are so close that they can't be seen separately, even with a telescope! Babylonians knew this part of the sky as "the scales" and associated it with truth and justice. This interpretation has been passed from generation to generation for thousands of years. Scorpius has a bright red heart: the red supergiant star Antares. Antares is so big that if it were put in place of the Sun, Mercury, Venus, Earth and Mars would all be inside it! Scorpius' tail was known to the Polynesians as the "Fish Hook". For Romans, this figure represents Asclepius, who in mythology watched snakes bring each other healing herbs. Zeus zapped him with a bolt of lightning to stop him making all humans immortal, and then put him in the sky to thank him for his good work. A classic case of being too good at your job! The medical symbol, sometimes used in pharmacies of a snake wrapped around a stick, also comes from this story. This is usually depicted as a Centaur (half man, half horse) firing a bow and arrow. It may be easier to spot if you look for a teapot shape. In 1846, Johann Galle saw the planet Neptune near the star Deneb Algeidi, (an Arabic name meaning "goat’s tail"). He was not the first to view Neptune through a telescope, but he was the first to realise that it was a planet. This part of the sky may be associated with water because the sun can be found in this constellation in the Middle East's rainy season. There are certainly plenty of other water themed constellations nearby e.g. Pisces (the Fish); Cetus (the Whale) and Delphinus (the Dolphin). Pisces is a faint constellation. The Sun passes through this constellation at the Vernal equinox, one of only two times in the year that day and night have equal lengths. The first human space-flight in history was in the Vostok 3KA spacecraft, launched on April 12th 1961. This flight made Yuri Gagarin of the Soviet Union the first man to enter outer space. The first space walk was performed on March 18th 1965 by Alexey Leonov. He spent twelve minutes outside the Voskhod 2 spacecraft. Helicopters are lifted into the sky by rotor blades that spin round very fast, pushing air in a downwards direction. Airships are filled with Helium gas in order to make them lighter than air. They also have engines and rudders to make navigation easier. As a plane moves forwards, the air above the wings becomes less dense than the air below the wings, thus lifting the plane into the sky. Orville and Wilbur Wright designed and built the first powered plane, and flew it on December 17th 1903. Balloons can fly because the hot air inside them is lighter than the cold air outside. The first recorded manned flight was made in a hot air balloon built by the Montgolfier brothers on November 21st 1783. According to the Greek myth, Icarus and his father, Daedalus, built wings out of feathers and wax in order to fly away from Crete. But Icarus met an untimely death when he flew too close to the sun and the wax melted. In reality, it gets colder the higher we get, so the wax would not melt! Concorde was a jet powered passenger aircraft that flew faster than the speed of sound. First flown in 1969, it entered service in 1976 and continued commercial flights for 27 years. Mercury is the innermost and smallest planet in the Solar System, orbiting the Sun once every 87.97 Earth days. Mercury is similar in appearance to the Moon: it is heavily cratered with regions of smooth plains, has no natural satellites and no substantial atmosphere. Unlike the Moon, it has a large iron core, which generates a magnetic field about 1% as strong as that of the Earth. It is an exceptionally dense planet due to the large relative size of its core. Surface temperatures range from about 90 to 700 K (-183 °C to 427 °C). Alvaston Park's model of Mercury is positioned just 58 metres west of the the sun. If it were to complete an orbit, it would go between the tennis and ball courts, through the AdiZone, and then cut across the play area before returning back along the near side of the lake. Venus is the second planet from the Sun, orbiting it every 224.7 Earth days. The planet is named after Venus, the Roman goddess of love and beauty. After the Moon, it is the brightest natural object in the night sky, reaching an apparent magnitude of -4.6, bright enough to cast shadows. Because Venus orbits nearer to the sun than Earth does, in the middle of the night the earth itself is in the way of viewing Venus and therefore it can only be seen shortly before sunrise or shortly after sunset. For this reason it has been known as the Morning Star or Evening Star. Alvaston Park's model of Venus is positioned 108 metres from the sun, on the path leading to the pavilion. If it were to complete an orbit, it would move along the path between the pavilion and the play area, swim through the lake in an arc from the nearest corner halfway to the island and then back to the next corner to the left, then go slightly out of the park before returning along the path to the south side of the ball games court. Earth is the third planet from the Sun, and the densest and fifth-largest of the eight planets in the Solar System. It is also the largest of the Solar System's four rocky planets (the ones in the park). It is sometimes referred to as "the world", the "Blue Planet", or by its Latin name "Terra". The planet orbits the Sun once every 366.26 times it rotates about its own axis, which is equal to 365.26 solar days, or one sidereal year. The Earth's axis of rotation is tilted 23.4° away from the perpendicular of its orbital plane, producing seasonal variations on the planet's surface. Its natural satellite, the Moon, began orbiting it about 4.53 billion years ago and provides ocean tides, stabilizes the axial tilt, and gradually slows the planet's rotation. Alvaston Park's model of Earth is positioned 150 metres from the sun, on the path leading from the ball games court towards Lakeside School. If it were to complete an orbit, it would move across the grass area before swinging to the left to smash through the pavilion, then skip across the lake and the island in the middle of it, and after a brief excursion outside of the park it would then return to its displayed location. Mars is the fourth planet from the Sun, orbiting it every 686.97 Earth days. Named after the Roman god of war, it is often described as the "Red Planet" as the iron oxide (rust) prevalent on its surface gives it a reddish appearance. Mars is a rocky planet with a thin atmosphere, having surface features reminiscent both of the impact craters of the Moon and the volcanoes, valleys, deserts, and polar ice caps of Earth. Mars is the site of Olympus Mons, the highest known mountain within the Solar System, and of Valles Marineris, the largest canyon. Mars can easily be seen from Earth with the naked eye, its brightness surpassed only by Jupiter, Venus, the Moon, and the Sun. 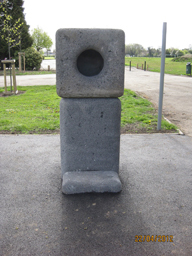 Alvaston Park's model of Mars is positioned 228 metres from the sun, on the path leading to the pavilion from the London Road pedestrian entrance. If it were to complete an orbit, it would move across the football pitches to cross the road that leads to the pavilion car park, across the cricket pitch and along the path on the opposite side of the lake. After leaving the park it would return along the path leading from the old Derby Canal and back along the edge of Lakeside School. The spin of the Earth gives the impression that the Sun moves across the sky. The Sun rises in the east, moves to its highest point towards the south at midday, and then sets in the west. We can use this movement to create a clock, or sundial. Stand in the middle of the sundial and your shadow will point towards the current time. The mosaics that make up Alvaston Park's sundial were created by the pupils of St Martins School. Apparent height of the Sun at midday in summer (Earth tilts towards Sun) and winter (tilt away from Sun). Arrows indicate Sun's angle from directly overhead. The tilt of the Earth also gives us more hours of daylight in the summer than in the winter. In order to make better use of these extra daylight hours, during the summer we shift our clocks forward an hour to give us longer evenings. Our clocks are normally on a system called Greenwich Mean Time (G.M.T. ), but in the summer we use a system called British Summer Time (B.S.T.). 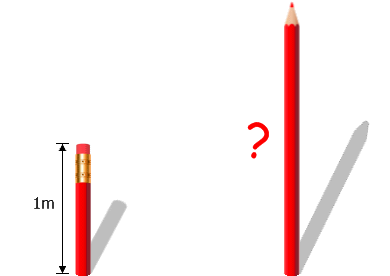 How do you calculate the height of the second pencil? Located on the path next to Lakeside School. 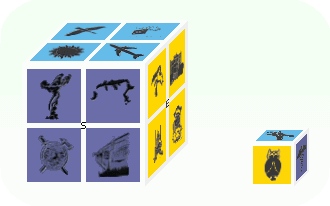 How much bigger is the large cube than the small cube? By length? By surface area? By volume? We are constantly surrounded by sound. So much so, that we often take it for granted and even try to ignore it much of the time. Why not spend a few moments in the park listening out for birdsong, or leaves rustling in the trees. Located on the path between the ball games court and Lakeside School, the Whispering Dishes are a chance to play with sound. If you whisper into one of the dishes, someone listening at the other dish should be able to hear you. Speak towards the centre a short distance away. You may have to experiment a little to find the best place to listen. This is called the focal point and it will be level with the centre of the dish, a short distance from it. Each dish is a special shape called a parabola. This shape is best for focusing waves. Some telescopes use parabolic mirrors for focusing light, these dishes use their parabolic shape to focus sound. They also have a large area to collect sound waves. Try cupping your hands around your ears, you should be able to hear a little more if you do this. 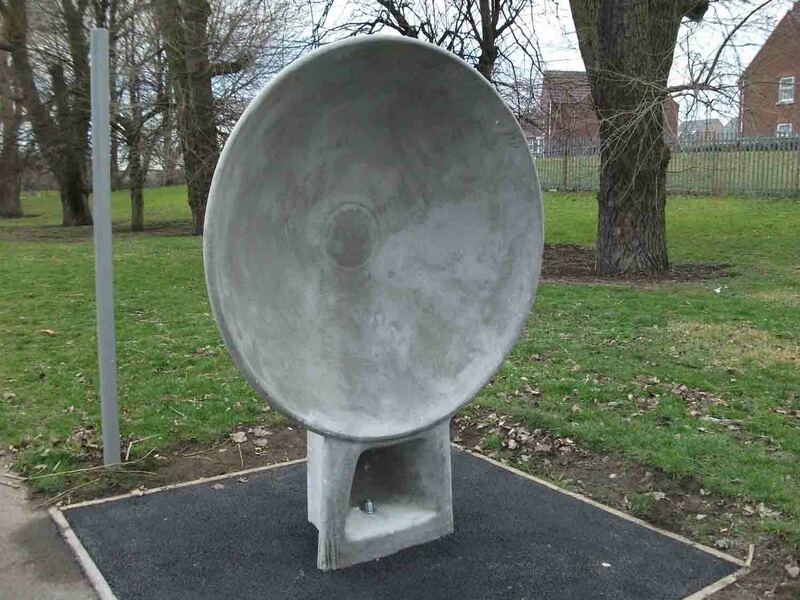 Before the invention of radar, large concrete acoustic mirrors were used on Britain’s coasts. These could collect sound from approaching aircraft, and were used as an early warning system. A microphone was placed at the centre, and someone nearby would monitor the sounds at a "listening post". A parabola is a special curve that pops up quite a lot in real life. If you kick or throw a ball into the air, the path that it follows will be a parabola. Water from fountains or hosepipes makes parabolic shapes as it travels through the air. Parabolas are important in astronaut training too. Before they go into space, astronauts are taken up in a special plane that flies in a parabolic curve. This makes them feel as though they are weightless and they float around just like they do in space. Feeling weightless takes a lot of getting used to and the training aircraft was nicknamed the “Vomit Comet” because it made many astronauts sick! If you have ever been on a fairground drop tower or on a roller-coaster that goes over the top of a hill, you may have some idea of what it feels like to be in space. By placing their head in the hollow of this giant stone, and humming in different notes, a separate enclosed world can be discovered. The note at which resonance occurs can be obtained, releasing a gentle vibration sensation into the recipient's body.